Apparently this simple recipe has been doing the rounds of the interweb - who knew? And here I was thinking I'd invented a true original. Oh well, I guess that's what happens when you're late to the Pinterest game. Regardless of provenance, this recipe is too elegant not to share. 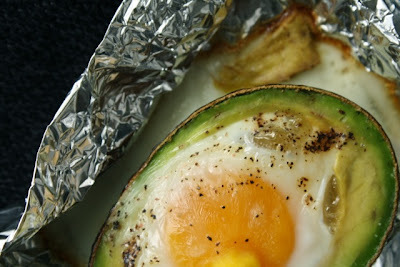 The Eggvocado is, in essence, exactly what it sounds like - an egg gently baked in a cradle of lightly-hollowed avocado. The elegance of the recipe is in its simplicity and versatility; you can top your Eggvocado with just about anything, from cracked pepper or parmesan, to chili flakes or a balsamic reduction (side note: I've been obsessed with balsamic vinegar of late - in my opinion, it's a culinary powerhouse that has yet to get its due). 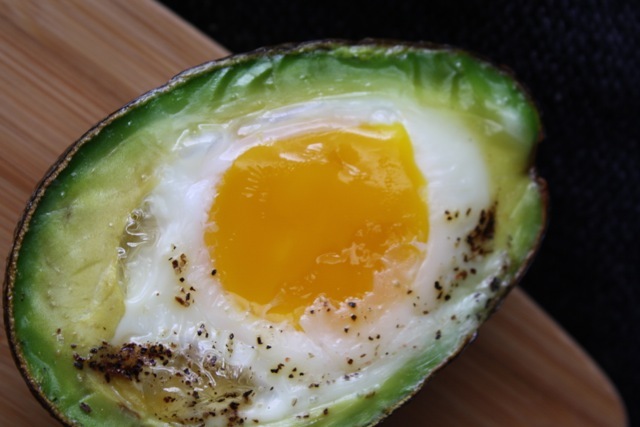 If I'm honest, I actually prefer the flavor of unbaked avocado, but it's the texture of this dish that really makes it; the ever-so-slightly molten egg combined with the creamy avocado is just dreamy - and remarkably filling. The recipe requires the minimum of prep, which makes it perfect for an indulgent snack or, paired with whole wheat bread soldiers, a luxuriant meal. I'd love to try it topped with bacon crumbles because, well, it's bacon. And avocado. And egg. A combination worthy of internet celebrity if there ever was one. My method is a little different than the original. I have my reasons, but pretty much any incarnation of this recipe will be worth your time. Preheat oven to 375°F. 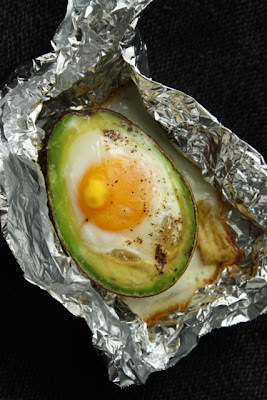 Using a small piece of aluminum foil, create a 'bowl' or 'boat' in which to bake your Eggvocado (or you could use a ramekin). Scoop out a small amount of the avocado to create a larger hollow. This will prevent your egg from overflowing completely (a small amount of overflow is normal). Place avocado in your foil 'bowl' and crack the egg into the hollow. Top egg with salt and pepper, and add toppings of your choice. Bake until egg reaches desired doneness (about 15 minutes should give you a tender yolk without runny whites). Serve warm. A few notes: A recipe so simple shouldn't need notes, right? That's true, but I wanted to explain my reasons for changing the 'original' recipe. The lower oven temperature makes it easier to control the texture of your egg. It will, however, also cook your avocado more thoroughly, so if you're not a huge fan of cooked avocado, you can bump up the temperature a bit. As I mentioned above, I'm a little put off by the taste of baked avocado, but the baked egg in this recipe is so divine that I'm willing to overlook this. Rest assured, if I come up with a way to have my egg and my avocado, too, you guys and gals will be the first to know! Oh man, two of my favorite things! So simple and definitely something I want to try. Visiting via HOP link party. Ohhhhh YUM this looks SO good I am for sure making this this weekend! Thank you SO much for sharing and for linking up!!! I never thought of those two flavors together but I bet this would be delish! I think I'm with Jamie, I'll have to make some this weekend. Amazing! I can see it topped with some fresh salsa and sour cream - cut up a tortilla on the side and dinner is done! Yum! Oooh - salsa is a great idea! Thank you so much for linking this up @ Fantabulous Fridays! My husband would die for this! Yay!! I don't eat eggs so I never know what to do with them, but he loves them!! Perfect! If you don't like the baked avocado, try it skillet fried with the egg instead of baked - gives a little crisp to the avocado but keeps all that buttery texture. That's a clever solution - thanks for the suggestion! I'll have to give it a try. Those were my thoughts exactly, but I was pleasantly surprised. It's still a little different, but tasty nonetheless. I hope you like it if you give it a try! This is amazing! What a wonderful idea, I can't wait to make this wonderful treat. This will be a perfect surprise for a special bruch that I am planning. Thank you so much for sharing with Full Plate Thursday. Hope you have a great week end and come back soon! Oh, Rachel ... I just made this this morning, and posted about it already. This was fab-u-lous!!!! Thanks so much for sharing! This looks delish, Rachel! and I totally agree with your balsamic comment!! Thanks for sharing! Thanks, June. I'm always glad to meet a fellow balsamic lover! This will be perfect for my husband (he's low carbing). Thanks for including your recipe at Foodie Friday! I hope he enjoys it! Maybe someday I'll have the discipline to go low-card, too - when cookies stop tasting so delicious! Oh my gosh just had this for breakfast and it was awesome, do you mind if I link it on my blog www.missinformationblog.com? Hello! I found you over at Tasty Tuesdays! This looks absolutely delicious. I just became a follower! Stop by and check me out when you can! Looks awesome! I guess you could just bake the egg separately and then put it in the avocado hollow after. I'm with you, I prefer avocados cold or at room temp. Great idea! looks delish, I think I pinned this on Pinterest! haha! thanks for sharing going to try this! I've tried a few different ways and ended up starting my egg in the skillet and "pouring" it into the avocado, then popping it under the broiler for a couple minutes, avocado stays "raw" but warmish- no where near as pretty as yours but the taste was to die for. I would love it if you came by CAST PARTY WEDNESDAY and shared your recipe with us. Thanks, I hope to see you there! 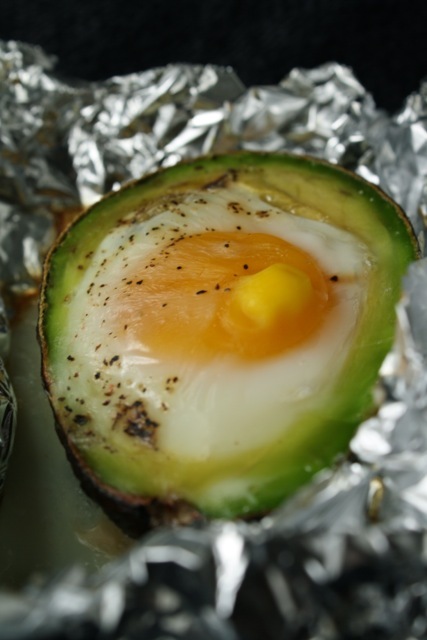 I'm not sure I would like baked avocado either..........but, we always eat our avocado on toast with a fried egg on top........YUM!!!!!! OH, and don't forget to top it with fresh homemade salsa! just tried it and discovered that, like you and many others, i'm not a fan of cooked avocado. but the combination is so doggone good that in the end, i found myself scraping the avocado from the skin to get the last bits! just make sure you scoop the avocado enough otherwise you will experience the comedy of errors that occurs with trying to keep the train of egg whites from completely vacating the avocado to reside in the tin foil. will definitely have this again! WOW!! How cool is this?! I never would have thought of this! Thanks for sharing at oopsey daisy! maybe just poach the egg and then put it in the hole?? That's a great idea! I'll admit I haven't made this as often as I've wanted because of the warm avocado - but you may have just posed the perfect solution!! Yum! Looking forward to trying this! Good - hope you enjoy it! I just made this Eggvacado, and it was superb!!!!!! I bumped the heat up in my little toaster oven to 425 and added balsamic vinegar and S&P cooking it for around 15 min, as I need the whites 'done', but the avacado didn't cook much so that was good. Bravo for sharing this recipe as I was desperate for a new breakfast, lunch and dinner. YUM! I'm glad you enjoyed it, Vanessa. I bet the balsamic vinegar was a perfect addition! And you're right - maybe quicker, hotter cooking is the solution to over-cooked avocado. i dont have an oven can i microwave this? jojoma, I can't say I'd recommend it. I've microwaved avocados before and they tend to get very mushy (and brown). If that doesn't bother you, you could try it but I can't vouch for the results! I believe that egg yolks explode in the microwave. If you want a nice egg with uncooked avocado, try poaching the egg and placing it in the uncooked avocado half. To make a great poached egg, you can add vinegar or lemon juice to the poaching liquid, as well as heating the egg in-shell for a short time to firm up the outer layer of white before poaching. Thanks for the tip! I love poached eggs so I see no reason why I wouldn't love your new spin on this recipe! this sounds totally amazing!!! I have mixed avo with eggs, but never thought to cook one inside. will have to soon enough!! Yum!!! This is a must try!!! I tried this tonight and added fresh parmesan and a balsamic w/ honey dressing I had in my fridge. I think next time I'll let bake a few minutes longer so the yolk isn't quite as runny, but all in all, it was delish! Definitely worth repeating! A baby downstairs to the store to buy drinks. The shopkeeper gave him a bottle of, then the child says no money.cheap rs gold The shopkeeper is angrily threatened:"Don't have the money to your mother!" The child was frightened out of bottle caps are off the ground. Pick up a see: come again a bottle of! So the bottle cap, gave it to the owner, walked happily.cheap wow gold Leave the owner to choose a suitable text book with a clueless look on his face. There are many wholesale bakeries, like Sara Lee, that produce cakes and biscuits on a large scale for comfort recipes purposes. Maintaining a wholesale bakery is not that easy, as it requires the knowledge of bakery management and the maintenance of hygienic conditions for the production of bakery foodstuffs. The Traveling Spoon is Getting Crafty!